Out now on DVD & Blu-ray and directed by James Kent comes Testament of Youth, based on Vera Brittain’s best-selling memoir of the same name. It tells the story of Vera, a young lady in 1914 who shocks her family and friends by making it into Oxford University, before choosing to potentially sacrifice it all to become a wartime nurse. As Vera struggles through this duty; her brother Edward, fiancée Roland and friends Victor & Geoffrey are all fighting the war on the front lines. With casualties mounting, will Vera’s loved ones make it? Wars aren’t only fought on the battlefield. I know, it just sounds like your average ladies-in-wartime drama film. But what it lacks in originality, it more than makes up for in the delivery. 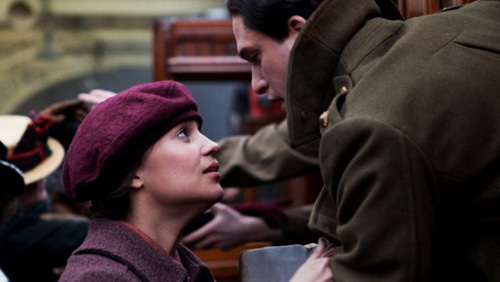 Testament of Youth is really a film of two parts; pre-war and war. The pre-war chunk, which comes in at around 45 minutes, is a stunningly beautiful and lavish period drama which feels like a really good Downton Abbey – watching the first half, I completely forgot that it was a war film. Perhaps intentionally, everything felt so idyllic, colourful and happy. You share in the characters’ youthful joy and, like them, you feel like nothing could possibly go wrong. But once we get into the war, things get progressively darker and more difficult to watch. Despite being marketed as a lovely little romance, Testament of Youth does not shy away from the harsh realities of war. But even then, the film remains hauntingly beautiful in its cinematography and style. Alicia Vikander (recently seen in Ex_Machina) is absolutely fantastic as Vera Brittain, and Kit Harrington (you know nothing, Jon Snow) isn’t too bad as her lover, Roland. Like any romance, they are the heart of the story as they’re the couple. Harrington is somewhat overshadowed by Vikander’s superb performance, but they work well together with strong chemistry. But Testament of Youth is truly an ensemble piece – like most period dramas, there is a rather vast list of characters and Taron Egerton, Colin Morgan, Dominic West, Miranda Richardson & Emily Watson all bring their full effort to the table and create an extremely believable production with their performances. But I feel like the film didn’t quite get as moving as others like it. I get it, in the war there were many deaths and you had to unfortunately take them in your stride and carry on. But for me, it felt like major deaths were very rushed, and brushed off rather abruptly. And while the film tried to end on a strong and powerful message about the futility of war, it seemed a little forced. But then, this isn’t a film that is particularly original or unique in its delivery, but it is very well made regardless. One thing I was rather worried about going in was the pacing – at 130 minutes, I was told it was a slow burner and was a subtle, understated piece. While this is true, I couldn’t believe how quickly it flew by! Testament of Youth is a fine film; I was very pleasantly surprised by the production values, performances and pacing in particular. This isn’t necessarily a film that stands out, or a film that you’ll remember for a long time – it’ll probably end up becoming a Sunday afternoon viewing for most – but for what it is, it’s a very decent wartime romance flick. Just don’t watch it with your partner…I’m not going to say “it doesn’t have a happy ending”, but…you know…it’s a wartime romance. I think the ending goes without saying. Testament of Youth is a surprisingly impressive film, and earns a solid 4/5. CeX Rugby wins "Retail Outlet of the Year 2015"